The upsurge in fighting around Ganfouda has seen the reported death of the son of a leading militant and the overnight launching of ten Grad missiles toward Benina. 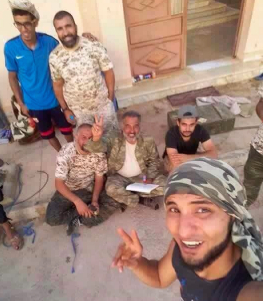 Shahin Al-Sharksi, the son of Mustafa Sharksi, leader of the Benghazi Defence Brigade, is said to have been killed in fighting in Ganfouda in the last two days. His father, who commanded a revolutionary force in Misrata in 2011, led an abortive attack from Ajdabiya toward Benghazi in July. The army claimed to have destroyed that BDB column when it reached Magroun and killed Mustafa Sharksi, which the militia later denied publishing a picture of their leader sitting with his men. The group has since pledged its allegiance to Sheikh Sadek Ghariani head of the Dar Al-Ifta in Tripoli. In the overnight Grad attacks on Benina, some 20 kilometres from Ganfouda, a number of residential building was hit but there are no reports of any deaths. The armed forces have struck back with airstrikes throughout today. It was a earlier airstrike, in which a man was killed and members of his family, including children, injured that was given as the cause of heavy shelling yesterday from Ganfouda again onto civilian positions, mostly in Benina.